I have been a bit lax in writing blog posts as client and investment responsibilities have taken precedence. On a day like today though, I feel compelled to type out a blog post recognizing today's record breaking bull market, or is it? For those believing today is a record breaking one, March 9, 2009 was the start of the current bull market; therefore, today represents the 3,453 day of the advance. This compares to the previous bull market record that many are indicating began October 11, 1990. This date is chosen as many believe the 1990's bull market began October 11, 1990. The problem with this date is the market decline from 7/16/1990 to 10/11/1990 is only 19.92%. 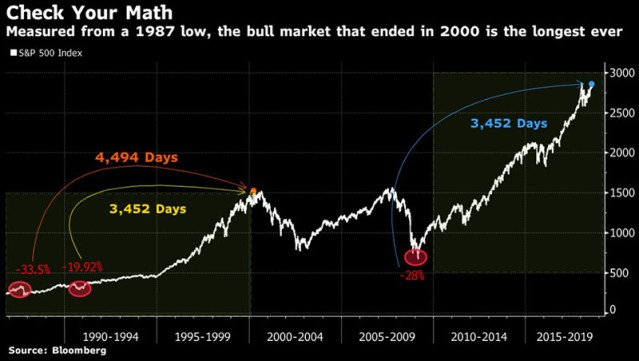 In order for the 1990 to 2000 bull market to be the earlier longest bull, one must round up the 19.92% to 20% as a market down 20% is considered a bear market. To me, this does not seem appropriate to round up to 20%. If October 11, 1990 is not the correct starting point for the earlier record bull, then what is? Well, one must go back another 1,042 days to December 4, 1987. That represents the bottom of the 1987 bear market that began on 8/25/1987 and culminated in the low on 12/4/1987 with the S&P 500 Index down 33.51%. As is often said, 'in time' records are made to be broken. As this current bull market ages, it has yet to break the longest bull on record that ran a total of 4,494 days. Some believe today's record breaking occurrence might be a bad omen for the market. 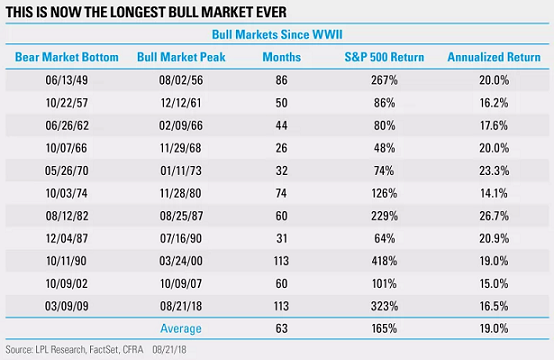 Those individuals can rest assured though, the earlier bull market record has yet to be shattered as it will take another 1,000+ days for that to occur.